The name seems too long : ) but this was the easiest way to describe it. It has been cooked mainly in these two so I thought to name it that way, of course it is actually a type of karahi too, but I did not use many karahi ingredients in it. This here is a very simply yet so fresh and different in taste. I usually use fresh tomatoes for all my dishes except one or two, as some time the taste of tin tomatoes is very nice and tangy mixed with our spices. I make it in the wok and it’s a work of hardly 30 minutes! The color is really extra rich and bright as you see here : ) I bought this very delicious soft butter naan from the Turkish shop, they make it fresh in the Tandoor in front of us and wow the baking aroma of it drives you really crazy. -wash and cut fine rings of the spring onions both parts green and white! -now put the spring onion in it and fry very light brown, don’t let burn! 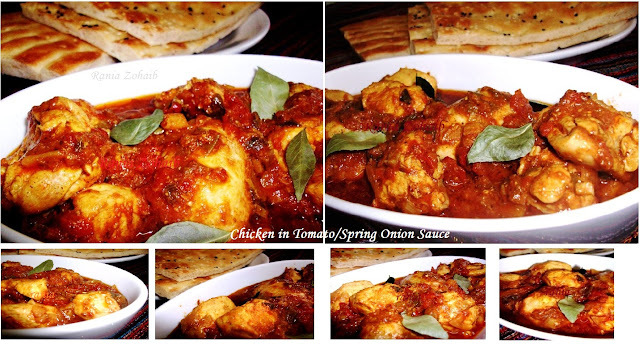 -the tomatoes will become softer and mix up with the spring onions into a thick sauce. Note: I don’t add any coriander powder nor the fresh one, the methi (fenugreek) gives it a very nice aroma, so that should stay! No extra green chilies as it is light and complete with the spices.